A recent pledge by Kalashnikov to compete with Elon Musk’s Tesla with a Russian retro “electric supercar” drew chuckles, but the legendary gun producer has long been trying to branch out into products from drones to yachts. The remarkable transformation by the manufacturer most famous for the AK-47 automatic rifle is without precedent in its 200-year history. Kalashnikov produces 95 percent of all Russian-made light arms and exports to some 27 countries. The rifle, designed by the brand’s namesake Mikhail Kalashnikov just after World War II and described by the company as “the greatest weapon of the 20th century”, is now in its fifth generation. 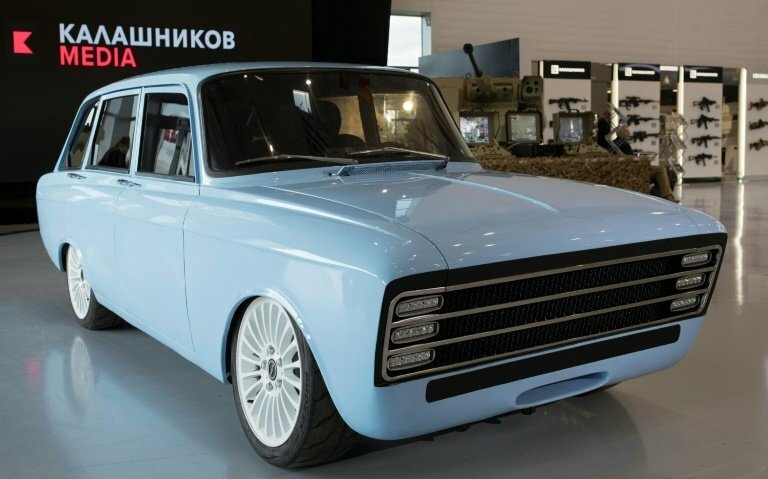 Visitors to the Kalashnikov stand at a defence trade fair outside Moscow last week were therefore surprised when they came across the pale-blue prototype of the CV-1 electric car, based on a 1970s-era Soviet hatchback, standing next to a display of rifles. Founded in Izhevsk (1,300 kilometres east of Moscow) in 1807, the Izhmash factory has seen a series of upheavals since 2013, when Russia’s state corporation RosTec, the controlling holding, merged it with a nearby pistol maker Izhmekh, naming the new company Kalashnikov Concern. Prior to the merger, the factory looked like it would meet a typical fate of many other Soviet-era industrial titans: in 2012 Mikhail Kalashnikov and other veteran employees lamented falling production figures, bad management and low salaries. After the arrival of private shareholders in 2014, the company launched new models of assault and hunting rifles, handguns and other types of small arms, along with an aggressive re-branding campaign that included introduction of a clothing line and accessories including caps and umbrellas. Just a few years later, these efforts seemingly paid off: in January 2017 the company went on a hiring spree, increasing its workforce by 30 percent to meet the rising export demand. Following the introduction of Western sanctions against it, Kalashnikov Concern changed a new subsidiary that was meant to work with the US market into a separate company called Kalashnikov USA. In February 2017, the Russian state became a minority shareholder after Rostec sold a large stake to Kalashnikov’s managing director Alexei Krivoruchko. In a shift for Russia’s defence industry, Rostec wants civilian merchandise to increase to 50 percent of its overall output by 2025. Though its CV-1 electric car prototype may never end up on the production line, it is a step into a growing sector which is still in its infancy in Russia. This summer, Kalashnikov provided 30 electric motorcycles and three-wheelers to the Russian police during the World Cup. “Next year we will launch sales of our first electric motorbike,” Vladimir Dmitriev, who took the post of director after Krivoruchko went to work at the defence ministry, said at the Moscow region defence fair last week. “We are talking about electric mobility because we understand that sooner or later the engine is going to disappear,” said Olga Boitsova, the commercial director for the company’s civilian products. In 2018-2019, Kalashnikov is set to start exporting electric cars and motorcycles to Saudi Arabia. Others were more sceptical and mockery proliferated Russian social networks. “Is this a gag?” asked the website MoteurNature.com dedicated to environmentally friendly transport. Sarcastic jokes also targeted Kalashnikov’s other product, a bipedal robot prototype nicknamed “Igorek” or “Little Igor” who was designed to aid soldiers in hostile environments and was also presented at the fair. Countless online memes compared the robot to designs that were popular in 1980s science-fiction films.